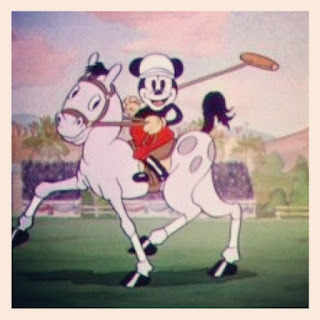 Disney Hipster Blog: Animation Appreciation: Mickey's Polo Team. Animation Appreciation: Mickey's Polo Team. Released in 1936, at the height of Walt Disney's polo infatuation, Mickey's Polo Team is one of the lesser known shorts. The studio does not rest on the high of Mickey/Donald mania rampant in the early 1930's. Mickey's Polo Team is a unique entry in the catalog of animation studio. The Disney studio was coming off of the huge success of early Mickey Mouse, Donald Duck, and the more recent Silly Symphony shorts. Not wanting to settle into a rut, this cartoon magically combines elements and characters from both. It is an amalgamation of early Disney characters from Goofy to Max Hare....oh, and celebrities. Yes, in a weird twist on the classic Disney short, this cartoon features many contemporary celebrities. Shirley Temple sits with the three little pigs, and acts much in the same manner. Meanwhile, the "grown ups" sit and cheer together. 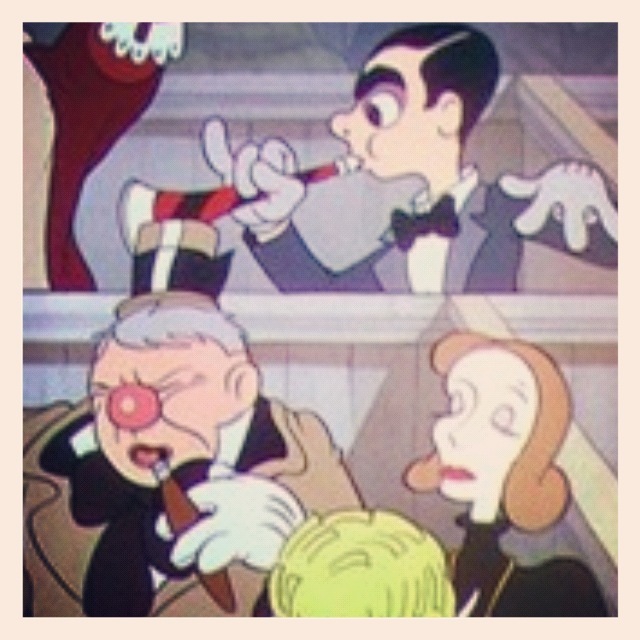 Eddie Canto, Greta Garbo, and W.C. Fields. Celeb cameos aside, this is a relatively uninspired short. It is less story driven than most of the Disney shorts, instead being driven more by premise and situation. Mickey and friends play polo against celebrities, chaos ensues. It doesn't go much further than that. There are a few saving graces here. For one, Mickey stays in the background leaving Donald to do his thing. Physical activity really suits Donald's type of humor, and the gags here pay off well. Of note is a scene toward the end in which Donald has swallowed the ball (polo ball?) and is being chased by everyone. Mickey himself even takes a swing at the poor Duck. Also, Laurel and Hardy, who are on the opposing team make a great alternate reality version of Donald and Goofy. Though not one of the best early Disney shorts, Mickey's Polo Team is definitely and interesting addition to the catalog. A weird mix of obscure Disney characters and forgotten celebrities creates a testament to the changing atmosphere of the company. By 1936 when this short was released, clearly the minds of the studio had drifted toward bigger and better things.